Thanks, Pinching Your Pennies for emailing me these great deals! Check out their website for more bargains! ShopatHome.com or EBATES are a great way to get money back on your purchases. I love both! Many of the following stores are on ShopatHome, Ebates, and Cashbaq! If you are new to these cashback programs, you get $5 just for signing up plus sign up is FREE! 25% off entire order + Free shipping on all denim at Children's Place! Free shipping on all orders including one item of denim at Children's Place! Automatically receive free standard shipping on your entire order when your order includes one item of denim apparel. No code needed! Children's Place also has denim in slim, plus and husky sizes! Stacks with quantity discounts! Save an additional 30% when you buy 8, 20% when you buy 5, or 10% when you buy 3. Shipping was $6.58 for up to 2 shirts. Personalized Banner (18"x54") - $8 Shipped! 6pm Deals! 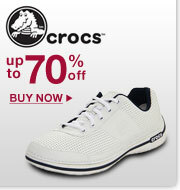 70% off Crocs, Clarks, Volcom, more! Ship your under $100 order for just $6.95! Grab it while it's hot! All items $10 or less! Outerwear extravaganza select styles $24.95 or less! Party on! Dresses up to 75% off! Clarks up to 70% off! Donald J. Pliner select styles $79.95! "Men's Big and Tall" up to 70% off! Elie Tahari select styles $89.95 or less! Creative Recreation up to 65% off! Free Shipping on $99, otherwise $7.95 Flat Rate. No code required. Extra $20 off + 20% off $75 Kids Shoe purchase at Amazon! Amazon has two promotions running right now on Kids Shoes that are overlapping as long your item has both promotions listed under Special Offers and Product Promotions section. Also, items must be bought direct from Amazon.com as the seller. Save 20% on $75 orders of qualifying items. Discount taken at checkout. Save $20 on $75 orders of select kids' back-to-school styles sold by Amazon. Discount taken at checkout. Prices below are before discounts. NOTE: some prices are valid only on select colors & sizes. *this link should take you to all shoes that qualify for the promotions. Just make sure to double check in product promotions to ensure qualifies for both. Also, shoes must be sold direct from Amazon.com as the seller to qualify.